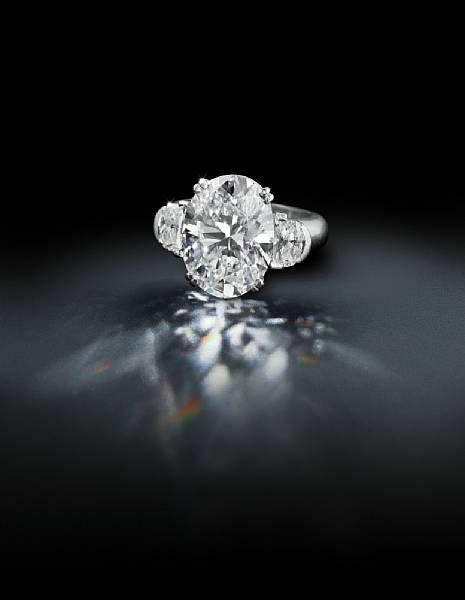 On December 16th Bonhams will mount a highly anticipated Fine Jewelry sale at their New York galleries. Consisting of 150 lots the sale includes an exceptional diamond collection, several antique pieces, as well as a number of outstanding pearls. One of the most sought after lots of the sale will be a spectacular diamond solitaire ring. Weighing 10.17 carats, the oval shaped diamond is accompanied by a GIA report stating E color and VVS1 clarity. Flanked by half-moon diamond shoulders, the eye-catching lot is estimated at $550,000-650,000. Also of great interest is an impressive diamond necklace comprised of fifty-nine graduated pear-shaped diamonds. 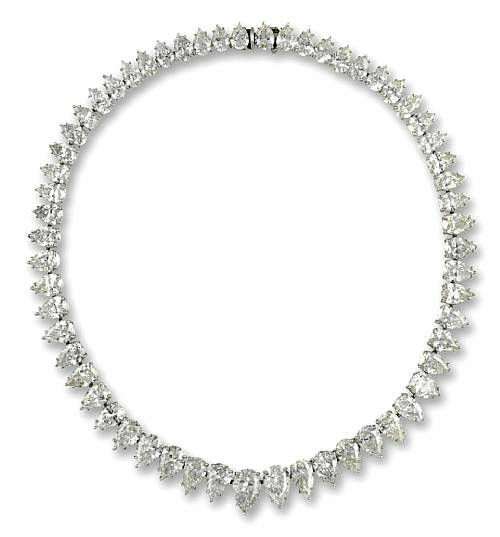 Ranging from 'D' to 'H' in color and 'Internally Flawless' to 'I' in clarity, the necklace has an estimated total diamond weight of 80.6 carats. 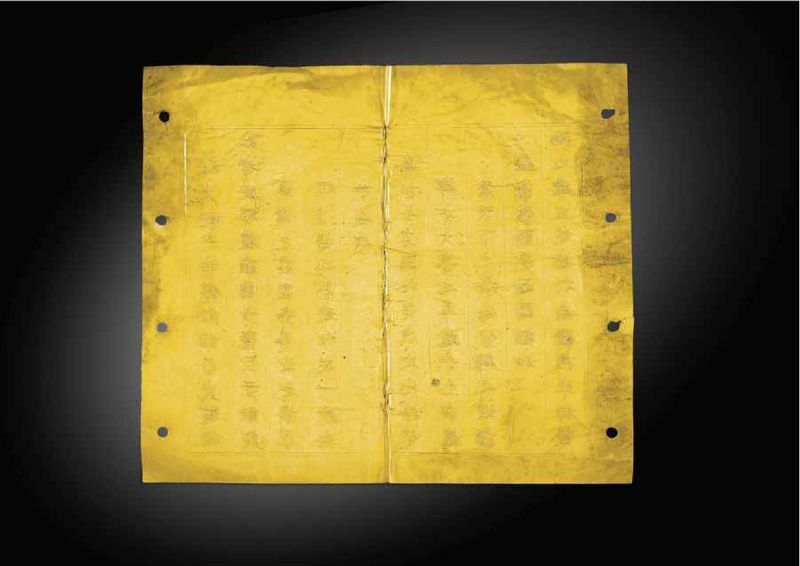 Carrying an estimate of $180,000-250,000 it is certain draw serious collector attention. From Rio de Janerio, a retro aquamarine, diamond and sapphire bracelet by Mauboussin is attracting pre-sale attention as well. 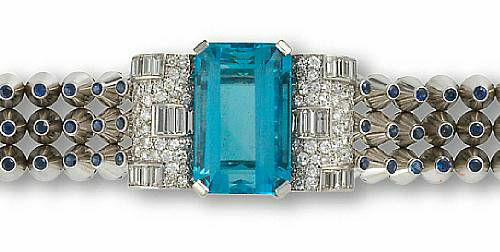 Circa 1939 the piece centers a rectangular-cut, 35 carat aquamarine within a scrolling panel of round brilliant-cut diamonds with baguette-cut diamond detail. It is completed by a three-row bracelet of cone-shaped sapphire collets. Estimated $20,000-30,0000, it is signed 'Mauboussin Paris', with French assay mark and mounted in eighteen karat white gold and platinum. Also cause for excitement is a notable collection of diamond pieces. The carefully selected group includes an outstanding necklace as well as a number of bracelets and earrings. The line bracelets found in the collection may prove to be perfect gifts for this holiday season and include a diamond bracelet comprised of thirty-eight square-cut diamonds weighing 19.30 carats (est. $25/30,000); an emerald and diamond bracelet designed as alternating sections of calibré-cut emeralds and square-cut diamonds (est. $7/9,000); as well as a diamond and ruby bracelet with alternating seven-stone sections of square-cut diamonds and calibré-cut rubies (est. $7/9,000). However, it is doubtless that one of the most desirable pieces in the collection is a pair of fine diamond pendant earrings. 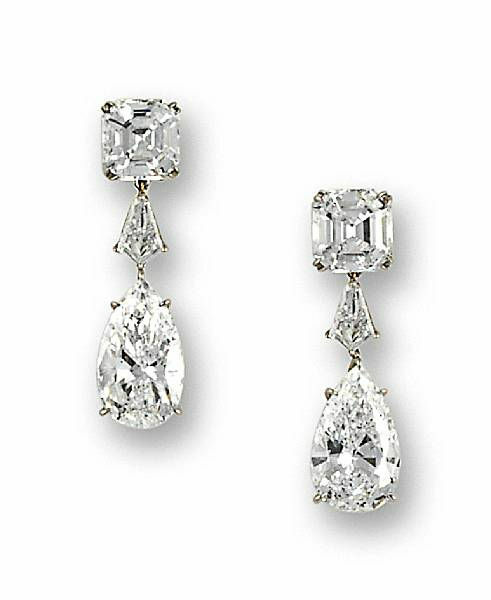 Each are designed as square-cut diamonds, weighing 3.23 and 3.01 carats, and both suspend kite-shaped diamonds as well as pear-shaped diamonds each weighing over 5.00 carats. 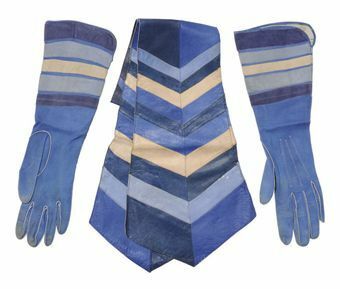 The square surmounts are detachable, enabling them to be worn separately. Estimated at $200,000-250,000, they are an excellent collecting opportunity. Additionally, a rare Oscar Heyman & Brothers diamond, sapphire, and enamel "Harlequin" brooch is certain to inspire serious bidding. The Harlequin brooch is one of the more challenging pieces to produce in the celebrated makers extensive line of creations. 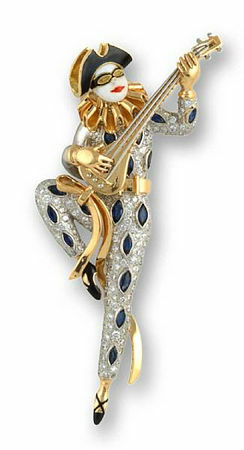 Made in 2001, this example is one of only eight Harlequin brooches that Oscar Heyman made over the last twelve years. Designed as a masked figure playing a lute, the body is pavé-set throughout with round brilliant-cut diamonds and accented with marquise-shaped sapphires. The mask, hat, and shoes are made of black enamel and the white enamel face is accented by hand-painted red lips. With a maker's mark 'no. 200791' and accompanied by a signed box, it is estimated at $15,000-20,000. Nice article, I feel that diamond bracelet suits every style it might be men or women. It can be a best gift for your loved ones, many new designs are arrived in market which can make your loved one feel special.